How long is too long to decorate a mug? I say this sort of without really needing an answer because in my mind they’re finished when they are finished and of course the price of the finished object should reflect this. Last week I made those 50 mugs and this week I have started on the slipping of said mugs. It’s taking me a while, I am 22 into it I think so there’s a good many left to do. Some were quick quick and some were slightly less so. Fun though, I am enjoying it, tomorrow I’ll start on the black slip ones. Biscuit has taken to settling down with me on my knee since Paul has been away. I hope she doesn’t go off the idea once he’s back. 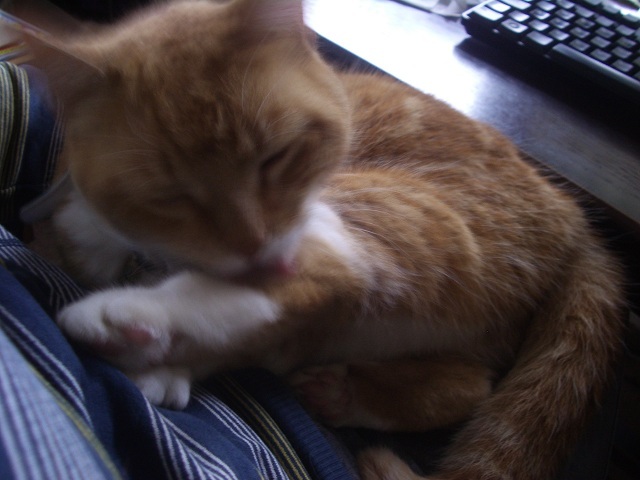 I’ve tried to take a photo as he’ll not believe me without one, it’s blurry but sweet. 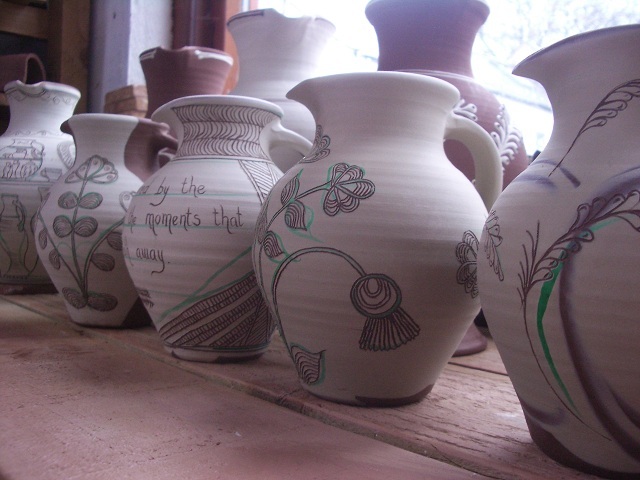 I’ve been sgraffito-ing some 2lb jugs along the way too. I want to have 18 2lb jugs to put in the wood kiln along with the 50 mugs. They are all thrown and some are slipped. It seems from where I am standing just now like I will never be able to make enough pots to fill that kiln again. Feels like a huge task. It is a pretty big task but it’ll feel easier once I get a few racks of finished pots drying out. At the moment everything is either very wet or under plastic. Yuck I hate shelves full of plastic. Spring Fling is on it’s way, first weekend in June, if you are the proud owner of a smart phone you can now download an ‘app’ (I know that will mean something to some of you though it bypasses my brain) to find your favourite studios and plan your route so you’d best get on and do that quick smart. Are you going to come and visit? Let me know if you can. Till next time, nightie night. This entry was posted in biscuit, blogs, fresh slip, hannahmcandrew.co.uk, mugs, slip trailing. Bookmark the permalink. 6 Responses to How Long is Too Long? I guess it depends on how much people will pay for them and how much you want to earn per hour. They are beautiful so you should have no problem getting a good price for them. It is easy to tell when a pots starts to get overworked- although one can miss that point as you carry on….and on…..! !I'll miss your blog. I like having both, although I don't do enough with my website. They are different beasts! Hannah if your web man can think of a way, I would happily go over your debautante website and see if there are any last tweaks you might want to make.Also why dont you leave your blog in blogger and just link through to it? That way you get the avantage of the blogger reach as well, I do that on the Nichols Buttons site. Maybe there is a good reason not to do that but I dont know what it is.